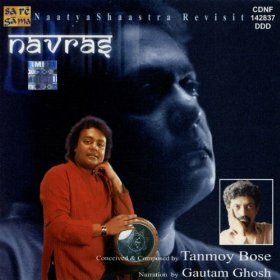 When he is not globe-trotting and being part of Grammy winning collaborations, world renowned percussionist Tanmoy Bose is helping popularise Bengali folk and Sufi music, helping tribal musicians get accustomed to studio settings; direct film scores and compose raga-based title tracks for regional TV serials in India. For someone who has been an accompanist to Pandit Ravi Shankar and Ustad Amjad Ali Khan for years and decades, Bose is quite a grounded and emotional artiste. When a musician’s eyes well up at the mention of peers he could have otherwise been conveniently jealous of, know, he has met his spiritual self. Bose barely makes a show of such feelings when he is talking about his music and times, and tries hard to be diplomatic but Sumati Mehrishi catches the best of this great maestro of our times and realises he is connected with his fraternity, its trends and movements, more than anyone else. You have accompanied Pandit Ravi Shankar on the tabla for over 12 years. His association with the world renowned tabla legend Late Ustad Alla Rakha Khan was for 30 years — the longest so far. Do you feel lucky? Definitely, I am blessed to have performed with Ravi Shankar for so many years. These 12 years have taught me a lot and helped me shape as a musician I am today. There was an emotional moment a few years back. Panditji told me after a concert that my performance had reminded him of Ustad Alla Rakha Khan, the greatest legend we have had so far. I strongly feel only Zakir bhai (Hussain) can match the sound and magic of his father’s tabla. So, to have heard the compliment from Panditji is the biggest honour I have got and known. Then, there is an emotional bond I share with him and his family. Panditji has been very happy to have become a grandfather. Then, recently, Panditji and I have been sharing our views on music, art, theatre and films. He enjoys it so much. Sukanyaji has video recorded these conversations, as she really wants to preserve these moments and Panditji’s thoughts. (Smiles as his eyes well up) Yes, I must tell you, he looks great in a beard. He has sported one for about six months now. During the last eight years, Panditji has spent a lot of time in the United States owing to illness and other reasons. You have been required to spend a lot of time away from home. Has it been tough? Yes. As a result my sons don’t know me much. But that’s part of my work. But, even at this age Panditji is performing ferociously. I am so inspired by how he carries himself as a performer. He fulfills his professional commitments, giving concerts that are sold out even before you blink. One has so much to learn from this. It still baffles me to see how people do anything to attend his concerts in the West. A woman in St Pittsburgh had sold her car to buy a ticket to Panditji’s concert. It’s a spiritual experience to be part of his musical journey. In 2007, Panditji returned after long illness. His fans in India were introduced to the small sitar he is using now. Its structure and sound are unique. How has it changed things for you? It is very challenging and fulfilling to be playing with this sitar in terms of rhythm and sound. These days, Panditji is giving it a special tantrakari affect where he plays the strings and numbs them down with the hand as they vibrate. The language is something really out of this world. Panditji really believes the ‘show must go on’. Your association with the world renowned sarod maestro Ustad Amjad Ali Khan also goes a long way. Tell us what it is like to be accompanying two of the biggest and busiest Indian musicians across the globe? I was only 21 when I had first performed with him. There are many aspects related to performance I have learnt under him. He would tell me little things now and then that helped me bring huge changes in my musical canvas. I would initially look at his hands moving on the sarod while performing, to be able to coordinate with his musical thoughts. He suggested I look into eyes and play. I think I have grown musically in front of him very much the same way as his sons Amaan and Ayaan Ali Khan have over the last 20 years. Between themselves, Amaan and Ayaan Ali Khan have developed their playing style and repertoire between in a wonderful way, especially during the last few years. What’s your take? I have felt the same. In fact, I communicated my feelings to them at a recent concert. They have done it subtly and magically with their hard work and riyaz. I can’t agree more. Your Guru Pandit Shankar Ghosh has become quite tech savvy recently with help from younger disciples. How do you feel about this change? (Laughs) I am so impressed to see that. Our maestros are so pro active even at this age. I am happy to see that a bunch of my Guru bhais are helping Guruji to connect with the younger audience through Youtube and social networking sites. I have heard he is giving online lessons as well. Thanks to him, Bickram Da (the world renowned percussionist and Pandit Shankar Ghosh’s son) and I have a wide approach to music. Though the music we make is very different, but our basics have been shaped by the same legend and that speaks for itself. You are promoting Bengali folk musical instruments and Sufi music from East India and Bangladesh in a big way. Do you consider it your artistic responsibility? I am sorry to say that artistes in our country do not believe in fulfilling their responsibility. Until artistes like me take the responsibility of promoting the regional culture, traditions and instruments, the coming generations will never be able to know what our rich heritage is about. There are so many percussion instruments from Bengal which have were made popular in the world music circuit after I initiated their use in collaborations. Dhak, the drums used in religious ceremonies and festivals has become popular. Then, there are so many instruments from Jharkhand that people are not aware of. In February this year, I saw the bauls singers of India and Bangladesh perform together at the unique confluence — Sufi Sutra, a festival dedicated to sufi music. Then recently, I have made several recordings of Jharkhand adivasi music at a Kolkata studio. They have sung beautifully. While I was recording, I realised that there is so much to be done and heard to get the best and the rarest of aspects related to culture in our rich country. We, as musicians need to be responsible and promote them. Bangladeshi world renowned urban baul Anusheh Anadil has led a successful crusade to promote baul philosophy, music and musicians. Has she inspired you? During the six years of my artistic association with her, Anusheh has come a long way. She has been able to promote the bauls in Bangladesh and India. People are waking up to the baul philosophy. Plus, Anusheh has grown commendably as a performer, a singer and thinker. There is so much to learn from her. Anusheh seems to have grown spiritually. Her thoughts on life and death are tremendous and they ruffle her peers and fans in the virtual world. I bet. She has grown spiritually. People are sure realising it. Actually, Anusheh has gained that sense of surrender which a musician is expected to cultivate — the sense of surrender to God is the essence of the baul philosophy. Do you consciously design a fusion performance? Yes, I believe in ‘designing’ a concert. It happens consciously. But I have a different approach to the idea of using raga music in fusion collaborations. I do not believe in making the hash of a raga. Thanks to my initial training in vocal music and my extended learning under Pandit Ravi Shankar and Ustad Amjad Ali Khan, I have known the importance of respecting a raga. The two musicians treat the ragas in a sacred way. I have learnt a lot from Anoushka (Shankar) in this respect. There are musicians like Ratul Shanker, Gokul Das and Sanjeev Shankar who help me realise my musical dreams. And, when you intend to treat a raga respectfully, ‘designing’ a performance, or planning it is the only thing that helps. Recently, my title track for a Bengali soap won an award. It is set in raga Puriyadhanashree. Incidentally, Anusheh has sung it. Initially, when I was working on the track, people at concerned media house rejected it saying it was too ‘traditional’. But viewers like it so much. Djembe, darbooka and other instruments from Africa and the Middle East are becoming very popular with young aspiring percussionists in metros. Strangely, not many of them want to learn the tabla or mridangam basics. Will it get them anywhere? No. People have to realise that until they learn they basics of Indian percussion music, they will not be able to do much in tap drumming (at least). Without the Math basics, one will not be able to produce more than casual thap thap sounds on the drum skin. Why did the best drummers from across the world want to learn from the great Ustad Alla Rakha Khan and Vidwan Vikku Vinayakram? Why do the most terrific drummers flock around Zakir bhai for lessons? Trilok Gurtu, Taufiq Qureshi and Sivamani are the best examples of how traditional drumming basics can lead a dedicated percussionist to a resounding musical journey. Sometime ago, one of my sons returned cribbing from school on how he was being teased by a bunch of friends for not learning the western drums but tabla. I got in touch with the friends and had a nice friendly conversation on music. Today, three of them are learning Indian drums. And today my son plays both western and Indian percussion instruments. Today legend drummers like Pete Lockett and Mickey Hart play Indian beat cycles so beautifully. Also, people in my own generation have to think beyond the exhibitionist slapping of cheeks for the lack of an instrument and ideas at performances.